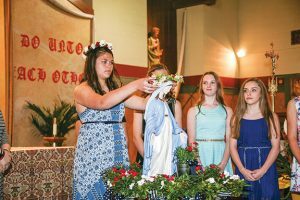 Peyton Lis, eighth-grade student at St. Joseph the Worker Grade School in Weirton, crowns a statue of Mary with flowers during the May Crowning Service held at St. Joseph the Worker Parish in Weirton May 4. Also pictured from left to right are eigth-grade students Isabel Loch and Kelsey Crawford who also served on the nine member court. May is the Month of Our Lady.